Radisson & Groseillers by Archibald Bruce Stapleton. Two coureurs des bois who went on to establish the Hudson’s Bay Company. Normally, my historical fashion posts go in chronological order but for this ~Special Edition~ we are jumping back in time a bit to take a closer look at those involved in the fur trade. 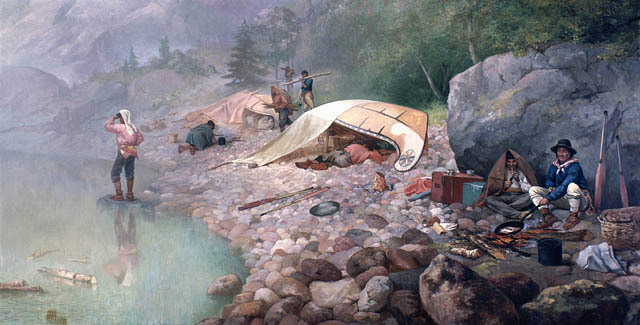 Voyageurs and coureurs des bois both played significant, yet distinct roles in the expansion of the fur trade and hold a place in the mythology of Pre-Confederation Canada. Who were the voyageurs and coureurs des bois? What were their similarities and differences? Above all, why were they important and how does their clothes factor into Canadian history? Job Hired by trading companies to transport furs and other goods between the St. Lawrence Valley and western trading posts. When the British took over, their travels expanded to the far northwest. 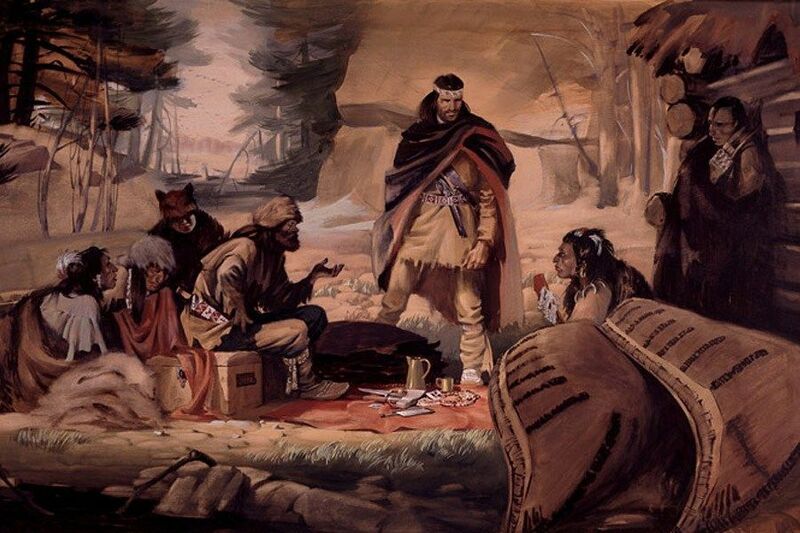 Independent fur traders/small businessmen. They trapped and traveled deep into the wilderness to trade with Indigenous communities. They kept all the profits. Legal Status Legal – In 1681, the congé system (licensed trade) was introduced in New France. Up to 25 congés/licenses were issued each year. A congé allowed three men to use a canoe to transport furs/trade in the west. Illegal – Worked outside the system. After 1681 they were unlicensed. The congé system was supposed to limit men absent from the colony, but coureur des bois threw a wrench into this plan. Although French-Indigenous trade happened throughout the 16th century, the fur trade really got underway when the first French trading post was established in Tadoussac in 1599. Founding a trading post was not only a practical business venture as it reduced risks for colonists, (venturing into the great unknown was not on a lot of people’s to-do lists), but it was also a way to establish territorial presence. Hence why the Dutch and later the English began to establish their own. To beat the competition, Samuel de Champlain sought to build alliances through cross-cultural interaction. He sent French boys to live in Indigenous communities and work as interpreters with pro-French agendas. These boys quickly picked up the languages and customs of the groups they lived with; the most famous of which was Étienne Brûlé. Eventually, grown men who worked in the fur trade began to do this as well, with the same end result. This served as the foundation of the voyageurs and coureurs des bois. Although Montreal became the center of the fur trade, waiting for Indigenous traders to come to them was no longer an option by the mid-17th century. Competition led the French Regime to spread further and further out into the west. Posts at Michillimakinac and Detriot were established. Who were the best men for this line of work? Those who had gained knowledge of surviving in the wilderness through cross-cultural interaction with Indigenous Peoples. You had to be good at hunting, canoeing, and fishing. Being brave also helped too given the number of risks (injury, drowning, hunger, etc) they faced. In addition, you had to be physically fit and a skilled negotiator as well. Despite the growing monopolization of the fur trade in the 1660s by the French Regime, there were those who sought to work outside the system. Jean-Baptiste Colbert, France’s Minister of Finance, did not like these independent traders. Not only did they hurt his bottom line trading-wise, but having lots of men leave New France (sometimes for years) was detrimental to the growth of the colony. To discourage coureur des bois, Colbert established the Congé System which made licenses necessary for legal fur trading. It was too late though. 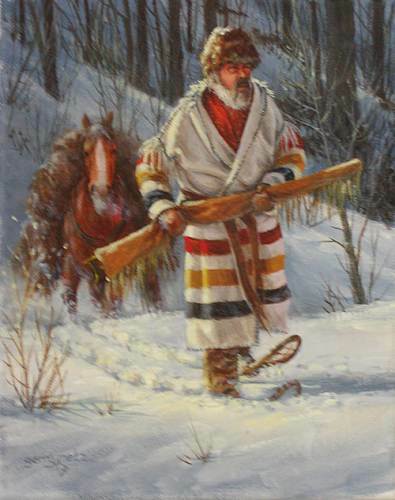 License or no license, coureur des bois kept on going out on their own* into the woods and traded independently with Indigenous communities. This led to nicknames like “Runners of the Wood” from the English and “Bush-Lopers” from the Dutch. * They weren’t always alone. Indigenous traveling companions were crucial when exploring somewhere new. Also, both voyageurs and coureurs des bois had relationships with and married Indigenous women. Originally, women were another draw of the fur trade. There weren’t a lot of them in New France until the 1670s. Voyageurs and coureurs des bois wore similar clothing, for the most part. Their fashion choices separate overtime namely because the coureurs des bois were no longer around and the trading companies took over. During the colder months, they would wear a large coat made of deer, moose, or caribou skin with a large belt around the middle. Belts could be made of leather or colorful wool. After the rise and expansion of the British trading companies, voyageurs had the option of wearing clothes supplied by their employer. For example, a voyageur who worked for the Hudson’s Bay Company might have chosen to wear a capot (or capote) coat with the traditional HBC stripes on them. (If they chose to make one themselves, the coat would have been any color of their choice). Capot coats were knee-length, had hoods, and were sometimes called blanket coats. Why? Originally they were made from a blanket that was sewn and transformed into a coat or cloak. Capot coats were together by a sash in the middle as buttons were rare. These thick wool coats still exist today. Underneath would have been a linen or coarse cotton shirt and knee-length breeches, (trousers would replace breeches for voyageurs by the end of the 18th century). Additional layers were worn underneath if the temperature was really low. These men may have worn waistcoats or vests, but some historians argue that this was uncommon. If wearing breeches, the bottom half of their legs would covered by deer skin leggings in the winter. Moose skin or leather gloves lined with rabbit fur were common and waterproof boots were essential. If necessary they would have used snowshoes. On their head they either wore a fur hat or a toque, (a close-fitting knitted cap). Red toques appear frequently in artwork, but other colors like grey and blue were worn too. Regardless of the season they would have had a musket with them. Also, the weapons and tools they wore on their person would have varied, but some of the possible items were knives, axes, pipes, a cup, cross-body purse/sack, tobacco, and alcohol. During the summer, they would shed the heavier layers. They would have opted for leggings made of fabric and used moccasins instead of boots. To protect their heads from the sun, sometimes caps or headbands were improvised from large handkerchiefs. Calling the Moose by Cornelius Krieghoff (c. 1868). The clothing of voyageurs and coureur de bois was heavily inspired by Indigenous Peoples. Voyageurs and coureur de bois dressed like them because of their jobs. It was much more practical to dress like an Indigenous person than your average well-to-do New France (and later British colonial) citizen, when trekking through forests and traveling long distances. In the case of coureurs des bois, it was especially important given that they could live in Indigenous communities for years at a time. Fun Fact: Indigenous/Voyageur fashion did influence New France/British colonial fashion overtime when it came to winter wear. Capot coats were a popular way to stay warm when venturing outdoors. So why did the voyageurs last until the 1870s while the coureurs des bois vanished around 1715? Well, Colbert basically got his wish (although he wasn’t alive to see it having died in 1683). Being a voyageur became a respectable profession. They earned a nice salary too. For six months of work, their income was about three times higher than the annual income of a farmer. As such overtime the draw of becoming an outlaw became less and less and the voyageurs took over and companies like the Northwest Company and the HBC began to hire them extensively. 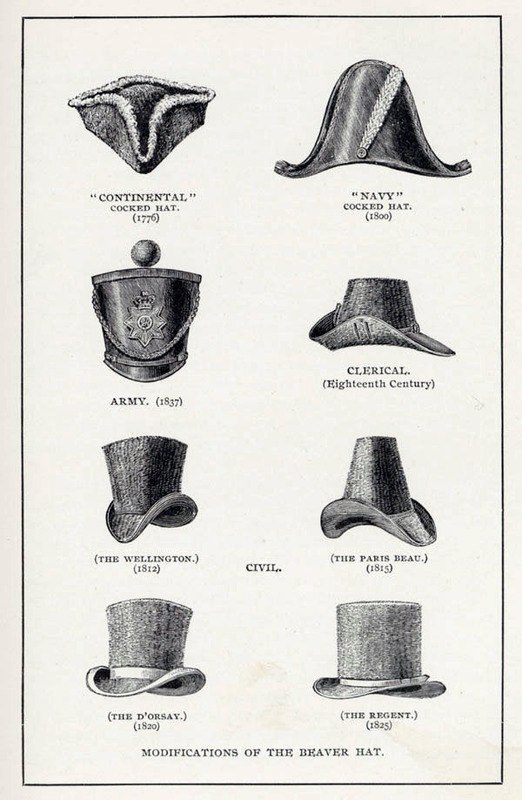 Modifications of the Beaver Hat. [Source] Although the price of beaver had its ups and downs over the centuries, using beaver fur to make hats was popular for quite a long time, hence the overall longevity of the trade. At the top of every fashion post on this blog is the statement “fashion was instrumental in the creation of Canada.” The fur trade is why I make this argument and both voyageurs and coureur des bois serve as great examples of the tie between fashion and Canadian history. Not only did their work play a major role in shaping the future of the country, but what they wore reflects the importance of the cross-cultural interaction between Indigenous Peoples and Europeans. Without Aboriginals, (both as trading partners and as aids in the growth of the industry), the fur trade would have never gotten off the ground. Cross-cultural interaction as a result of the fur trade was absolutely crucial for the economic and geographic development of Canada. Gross, Konrad, “Coureurs-de-Bois, Voyageurs and Trappers: The Fur Trade and the Emergence of an Ignored Canadian Literary Tradition.” Canadian Literature 127, (1990): 76-91. Podruchny, Carolyn, Making the Voyageur World: Travelers and Traders in the North American Fur Trade, University of Toronto Press, 2006. Little did those HBC voyageurs know that those coats they are wearing would a) still be around centuries later and that b) they, or something very similar, would retail for as much as they do! I love the HBC point items but my bank account does not! As much as I love HBC for keeping their historical items/designs around, I just looked up how much their striped Point blanket costs. $350?!?!? Madness! I wonder if those blankets are still as itchy as the one my parents had about 40 years ago. I find it fascinating that, especially in the late 1600s (HBC founded 1640, i believe), French traders would work for the HBC. Then again, maybe that’s why Minister of Marine Colbert wanted them all to have licenses, to make sure that they were not trading with the English. Definitely not a dumb question! I assume you are referring to the “French Trapper in Winter” painting. The Hudson’s Bay points blanket was first introduced in 1780, 17 years after Britain had defeated the French in the Seven Years’ War. After the British took over New France in 1763, French fur trading companies were replaced with English ones, so you had French trappers working for the HBC by this point. The multicolor striped blanket that so many relate to the fur trade was introduced around 1780 and was commonly known as the “chief blanket.” The point system was initiated around the same time and was used to determine wool quality and size of a blanket. It did not necessarily mean that a 4 point blanket was worth 4 mb(made beaver). It was at the discretion of the tribe being traded with. Hudson Bay also never manufactured their own blankets. Several companies made blankets for not only Hudson Bay but also the later Northwest Company and American fur company. A vast quantity of blankets were manufactured in the English town if Witney. Because of this, many blankets were commonly known as Witney blankets regardless of the manufacturer. 1890 is when labels were first known to be used on blankets, before then it would have been difficult to determine the manufacturer. 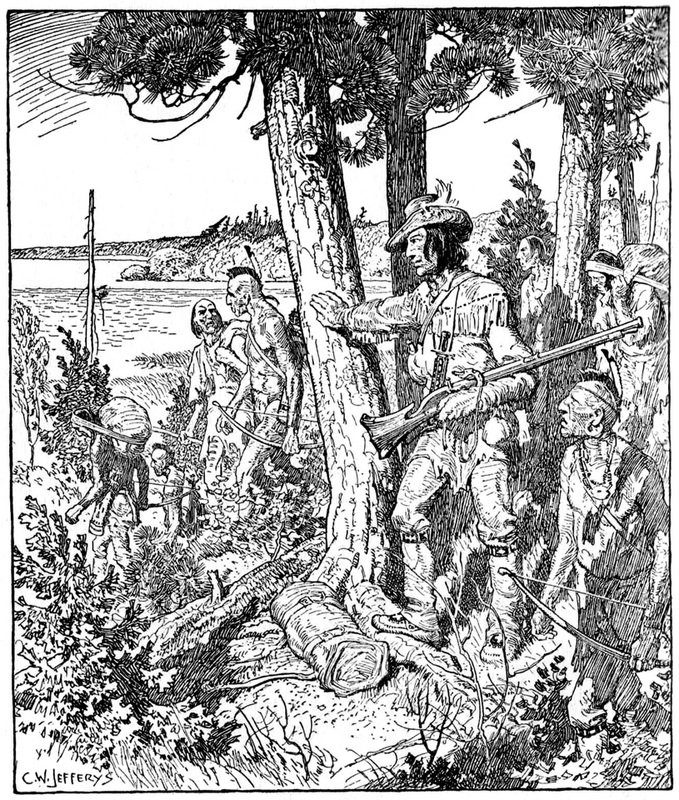 Now, HBC did begin to recruit the outlawed coureur de bois as an employed voyageur(engagè), but it was until the establishment of the Northwest Company in 1779 that the coureur de bois was utilized on a larger scale as a voyageur. Both companies were English owned but employees were predominantly of French decent. Although, a smaller portion of the workforce was made up of Scottish, English, Iroquois, and other First Nations people. It was the less regimented NWC the was able to attract the coureur de bois to its ranks. A pretty vague history lesson. I could go on forever with the plethora of information surrounding the fur trade in what is now Canada and the Great Lakes region, but that should be enough to begin to answer your question.